Mandy's going to be posting about a spray paint project here pretty soon so I thought I'd see her spray paint and raise her a Mini Cooper. Mandy's project involved a mystery table (she calls it an end table) that she picked up for $6 at a garage sale. I wouldn't have picked this table if they'd offered me $6 to take it off their hands, but nevertheless it ended up in her van. Two rattle cans later and voila. 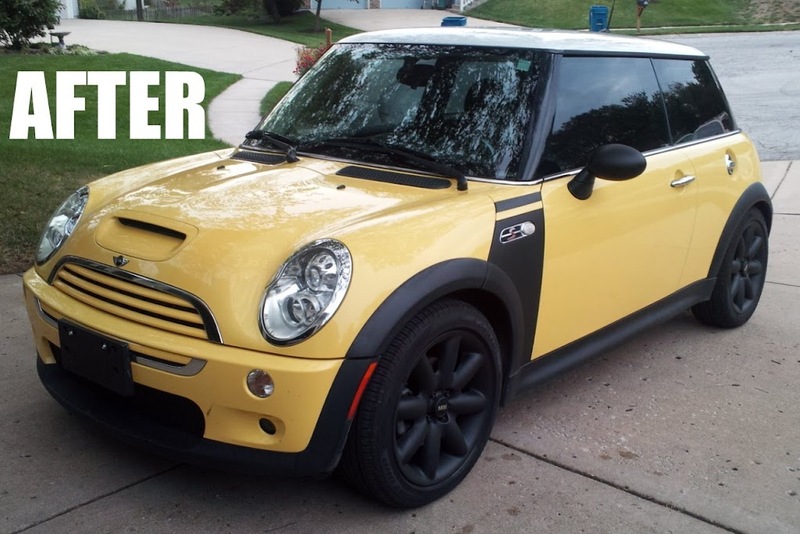 My project was yellow Mini Cooper S that I'd bought sight unseen. I knew it was yellow, but I didn't know it had white wheels and needed a big flower on the door. So I picked up a few cans of PlastiDip, an amazing spray paint that you can peel off later should you change your mind. Which before after project gets your vote? OMG, I love her table, if you still want that $6 I'll happily give it to you...oh your wheels are okay too. i may be a girl, but your car looks amazing! well done! Removable spraypaint? Shut your face! Oh my gosh!! My thoughts exactly!! You took off the racing stripes, too? I feel like the car is a bit off balanced...I like what you're going for but maybe black wheels is too much? Or get rid of the white top? 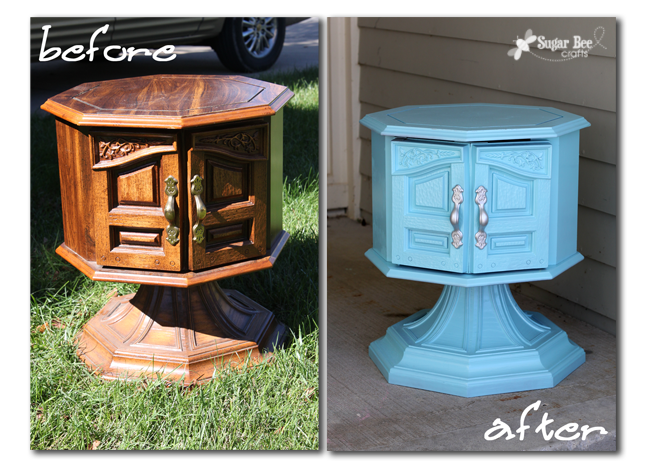 I love the blue she painted her table; hopefully you guys are selling it! The stripes were non-silhouett-cut vinyl and peeled off. Both paint jobs are well done. But even though I am a girl, I am loving what ya did with the Mini Cooper.... you were right a little too flower power before. I am definitely picking up some of that spray paint!!! The car does seem a bit off balance now. I like the black top idea, but the front seems lacking too. Perhaps if the lower front bumper were also black? I think the car has gone to the dark side and no white can remain, not even in a 'stenciled' checkerboard. It looks so much more grounded and less toy like. Is the top white? I don't see white on the top, I thought it looked yellow...but I cannot find my glasses for anything and I just tore the couch apart looking. Mandy's table is quite funky and I love the color she chose but I would love a Mini Cooper. Cooper gets my vote!